Anyone who loves and admires felines will appreciate our next healing gemstone, Tiger’s Eye. A member of the quartz family, Tiger’s Eye is typically a golden-brown banded opaque stone found chiefly in South Africa, Australia, and Thailand. This powerful, mysterious talisman was once thought able to grant the wearer ability to see even through closed doors. Egyptians placed it in the eye sockets of their deity statues; Roman soldiers carried it into battle to deflect weapons. Relatively durable (6.5 to 7 on the Mohs scale of hardness), Tiger’s Eye today is a popular gemstone for jewelry, ranging from cuff links to pendants, rings, and bracelets. Typically cut into cabochons to take full advantage of its silky luster, Tiger’s Eye is said to promote harmony, release fear, enhance creativity, and endow its wearer with courage. Tigers (or even house cats) are the epitome of patience (or is it intuition? ), waiting and watching for that perfect second to pounce. Tiger’s Eye gives its wearer similar intuition, restoring faith in one’s deepest self, filtering out distractions, and boosting belief in our ability to accomplish our goals. I made this bracelet with Tiger’s Eye interspersed with fancy Jasper. Metaphysical healers believe Tiger’s Eye helps with eye and bone problems, may alleviate depression and nightmares, boosts the endocrine system, and can help lower blood pressure. Tiger’s Eye grounds the solar energy into the earth and stimulates the lower chakras, supporting physical vitality, practicality, and balance among extremes. While not a traditional birthstone, Tiger’s Eye is a natural birthstone for those born in midsummer (July 22-Aug. 21) and a zodiac stone for those born under Gemini (May 21-June 20). Golden crystals are said to bring success, enthusiasm, and happiness. Feng Shui practitioners urge the placement of Tiger’s Eye in the south area of a home or room (fame, reputation) to take advantage of its fire or Yang energy. Avoid harsh cleaning chemicals — even hairsprays and perfume — around your Tiger’s Eye gemstones. Protect them inside a fabric-lined jewelry box overnight. Note: The claims here aren’t meant to take the place of medical advice. They’re based on folklore and various other sources, and likely “work” best if one’s belief is strong enough! This entry was posted in Sunday's Gem and tagged healing gemstones, properties of Tiger's Eye, tiger's eye. Bookmark the permalink. What’s especially interesting is how deeply the tiger’s eye has embedded itself in human culture: from this modern song that even I know to William Blake’s poem, “The Tiger.” “Tiger, tiger, burning bright in the forests of the night” is a line that even people not given to poetry may have heard. And the stone itself is beautiful. I think the tiger’s mystique draws us all, even dog-lovers. Who could help feeling mesmerized when looking into those eyes? Even photos of tigers’ eyes have that effect on me. That said, the stones are lovely. Some of us just gravitate to particular stones, and for me, Tiger’s Eye always has been special! I love Tiger’s Eye, Debbie! I have a beaded necklace that I wear all the time. No wonder I’m drawn to it, my birthday is August 18th. Now I know. Of course, I think I’ve mentioned to you that I have, ahem, more than one cat. I thoroughly enjoy your gem posts, and especially this one as I have learned more about one of my favorites. No wonder you gravitate to Tiger’s Eye, Lana! Lucky lady you are, because this is a truly special stone. Wearing it probably gives you extra courage and determination, great qualities for Leos to have. Glad you’re enjoying my gemstone posts — I find I’m learning so much from them as well, and the education makes me appreciate them all the more! And yet another fascinating and informative gemstone post, Debbie! 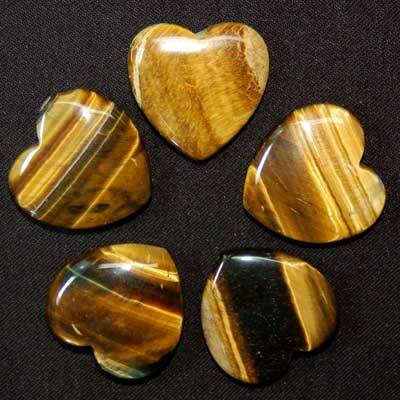 As you know, I am most definitely a cat lover; therefore Tiger’s Eye has always been a gemstone I’m attracted to. I especially love its color. And you taught me something because I had no idea that Tiger’s Eye was a natural gemstone for both Leo and Gemini! LOVE the bracelet you made. I like how you married Tiger’s Eye with Jasper. Really beautiful combination! Hope you’re having a fabulous Sunday, my friend. We’ve had quite a bit of snowfall, so I’ve been outside these past two days, enjoying it. Thank you so much, Ron, for your kind words — they’re music to my ears! I’m not a Leo or a Gemini, but I really like Tiger’s Eye. For me, it’s the color that’s so special. It looks amazingly like Dallas’s coat; in fact, if I placed that bracelet atop his back, it would get lost in the golds and browns there! I feel a kinship with certain stones — Jasper is one of them. I tend to go through phases of inundating my jewelry collection with a particular stone, then move on to something else. Some, however, just have more staying power (and Jasper definitely does). Perhaps I should write about Jasper next time. I know what you mean about the smoothness. There’s something so calming about holding a Tiger’s Eye. I like tiger’s eye, Debbie. This was an excellent post. Why, thank you so much, my friend! Beading with gemstones the way I do makes so much more sense when I can understand and appreciate their special characteristics. I know . I like this feature. Tiger’s eyes are pretty. I don’t personally have a feline connection, but I know many who do. I love the fact that it’s a natural birthstone for my mother..she’s Def a tigress. I’m more of a dog-person myself, but I love the way Tiger’s Eye mimics the colors in Dallas’s furs. All those golds and browns are so autumnal! Now you’ve got a good thing to give your mom for birthday or next Christmas!! The Tiger stones are amazing. Love the patterns, how distinctive they are. I love how you know all about these stones, as well as others you’ve featured. It’s so interesting. Thanks for sharing! Monica, I merely *wish* I knew all about these stones! I have a general idea about most of them, but until I actually do the research, I really have no clue just how special they all are. That’s one reason I started this series — to have a single location where I can refresh my memory without having to search all over the Internet! Love the bracelet you made – so pretty interspersed with the jasper. I recently purchased a tigers eye necklace to coincide with and add strength to my solar plexus chakra – that of power and choice. It’s a gem (pardon the pun). Are you back, my friend?? I’ve missed you! Your necklace sounds perfect — we all need to feel in command of things like choices. Thanks for dropping by; now I’m off to see what you’ve been up to! Tiger eye! And it even has a coolio name. I must needs get some. You must!! And ’tis sufficiently masculine so you’d look splendid in it! I’d wear it on my…well, I’m not sure. Cuff links or tie clasp … when you have to get all fancied up! Gee, I’ve missed seeing you, Kb! Hope your holidays were splendid. 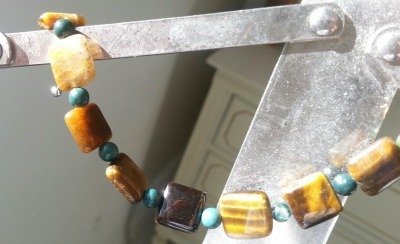 A Tiger’s Eye necklace? Yes, sounds purr-fect! !